March | 2014 | Every good thing…. 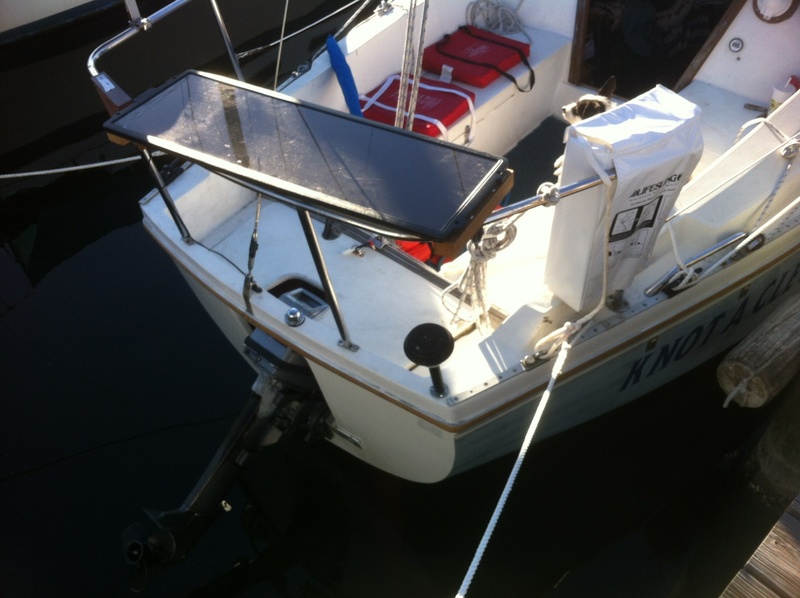 Currently the LoriBell has a single solar panel supplying its’ power needs. Th positive side of the panel goes to a Sunforce 10amp Controller. 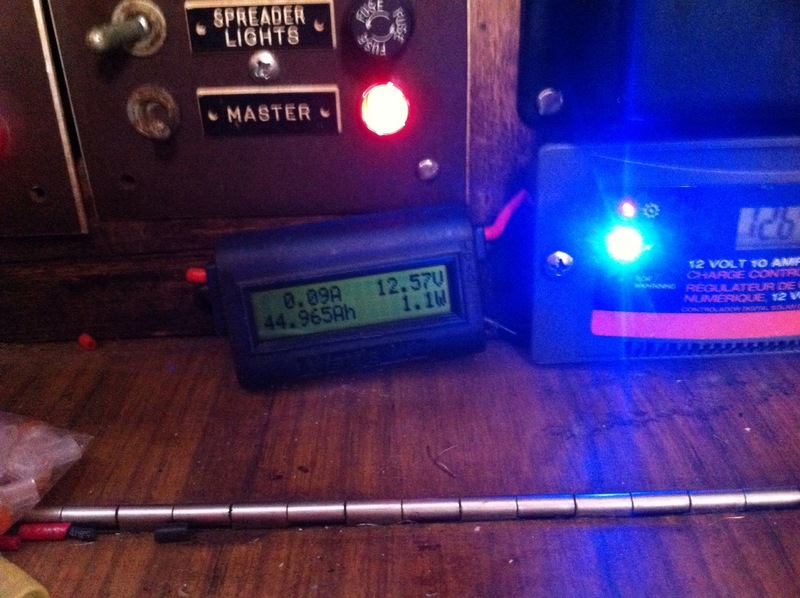 And then the Negative side of the panel runs through a Watts up meter on its way to the controller. WattsUp meter left, controller to the right in the above photo. I have the controller output wired to the always hot side (with an inline fuse) of the battery selector switch. I keep both of my battery banks in on position when we are away from the boat so they are both constantly being charged or floated. I keep the mains on the bottom of the DC panels off. 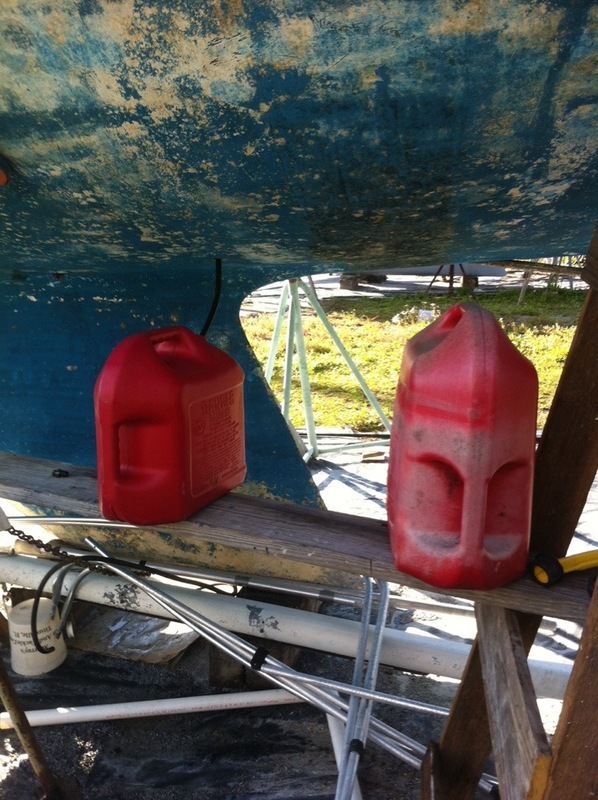 This results in all 3 or our batteries (2 house in bank 1 and 1 starter battery in bank 2) also supplying the bilge pump that is hard wired to the start battery. 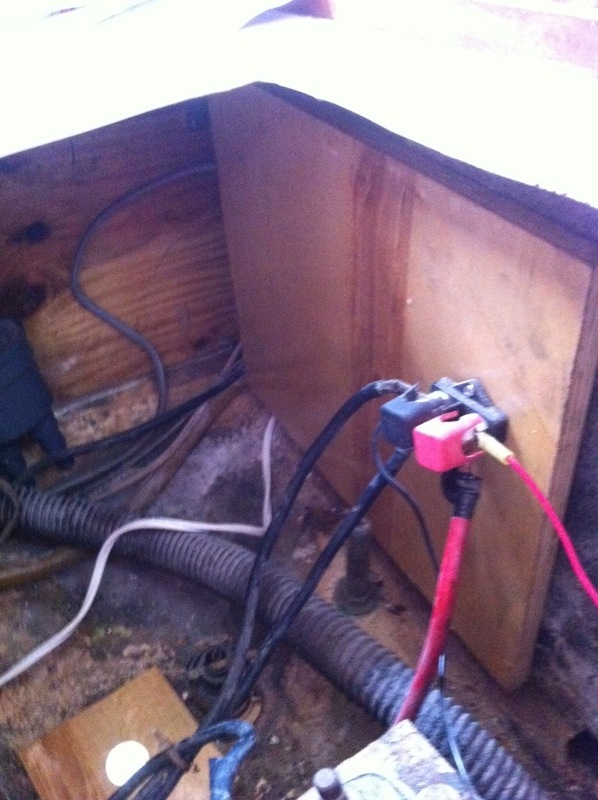 By wiring the -dc from the panel thru the neg side of the meter I can look at amps hours generated, current and total. The panel currently sits on the top of the house. Plans are to install it much the same way as we have the 15watt panel on the Clew. 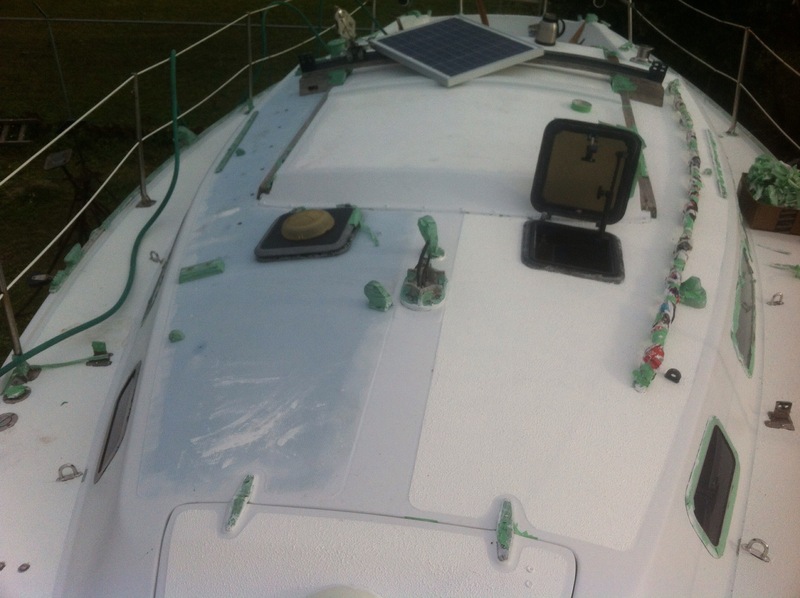 15 watt panel on the Clew stern rail. We currently are running 2 house batteries totaling around 210ah or so. We run our FM radio, charge our cell phones, 2 vhf hand held radios, run a fan, led interior lights, fresh water pressure pump and the solar panel has been able to keep pace. I do want to get a better grade of controller and possibly another 50watt panel for extended cruising. The reason for a better controller is due to the WattsUp meter. It shows the max we have yet to see is 33watts out of our 50watt panel. A true Mppt controller has less loss than the low end Sunforce, we should be able to get over 40watts out of our panel, better utilizing the space used by the panel. Join us on a a voyage to the land of good e-nuff…. Our plodding pace of restoration has come to an end. 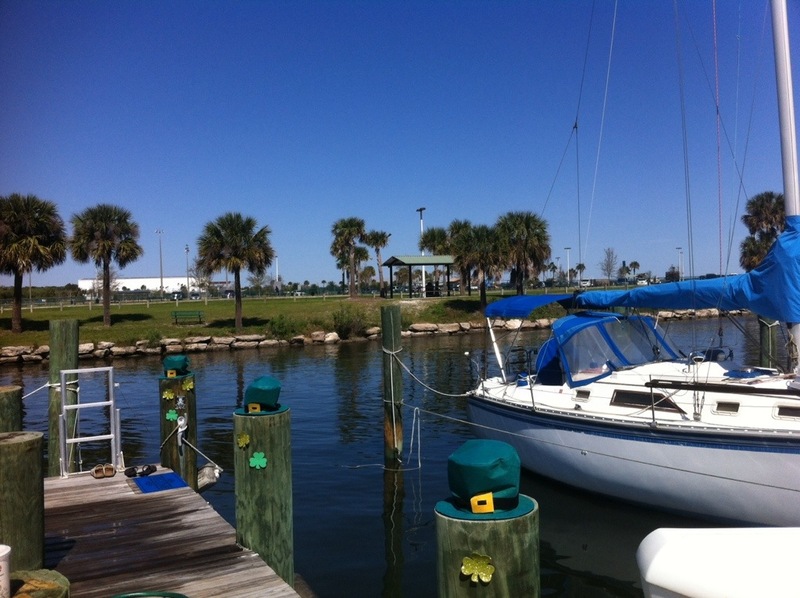 Now we are faced with a deadline, in one month we will be boxed in by snow bird boats returning from their winter in the tropics, our boat will have to be moved, we prefer it to be into the water. 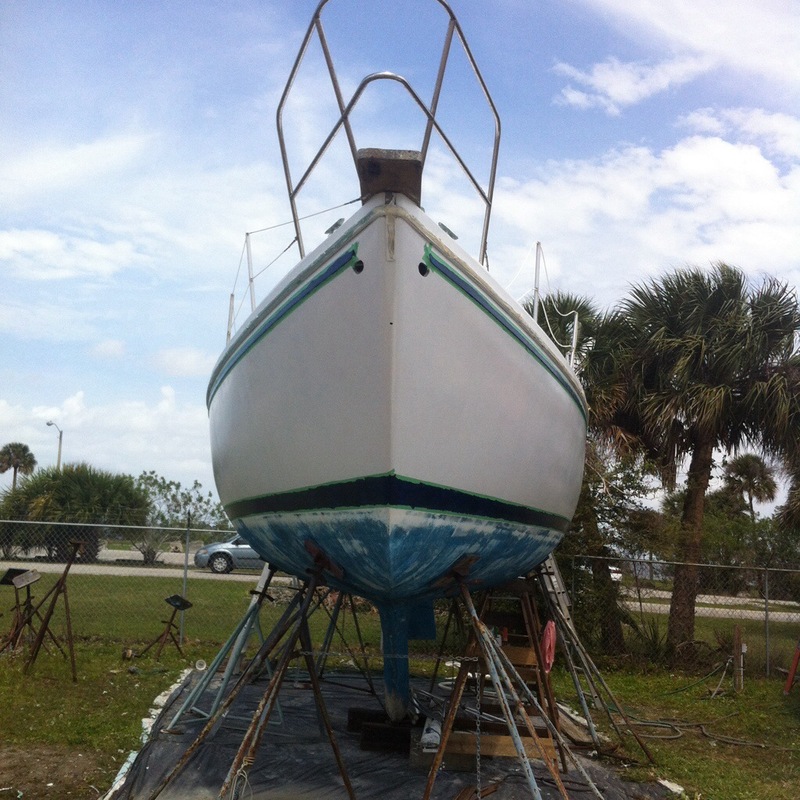 We need to fill the holes in the hull, paint finish painting her and drop in the Atomic 4 currently sitting partially assembled in the garage. We have about 3 weekends to get it all done. 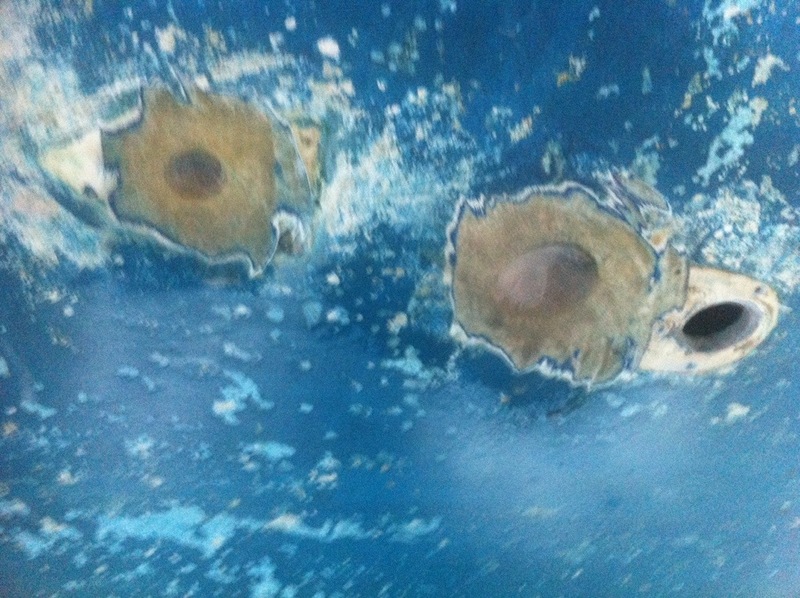 We started the week by drilling holes and in the hull for our 2 new thru hulls purchased from Defender. First to get done was the galley sink thru hull. Here is someone testing these particular thru hulls. 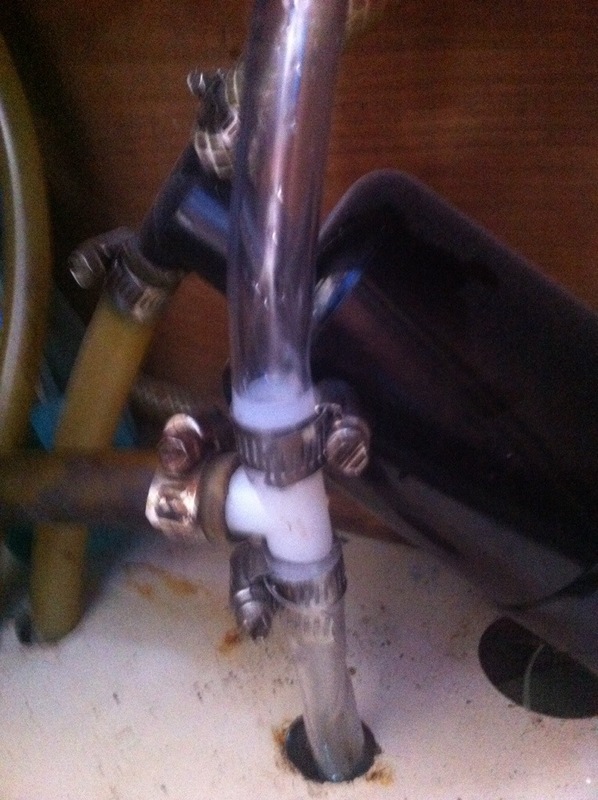 Of course after replacing the valve we had to replace most of the galley drain plumbing as well. She has her stripes again. 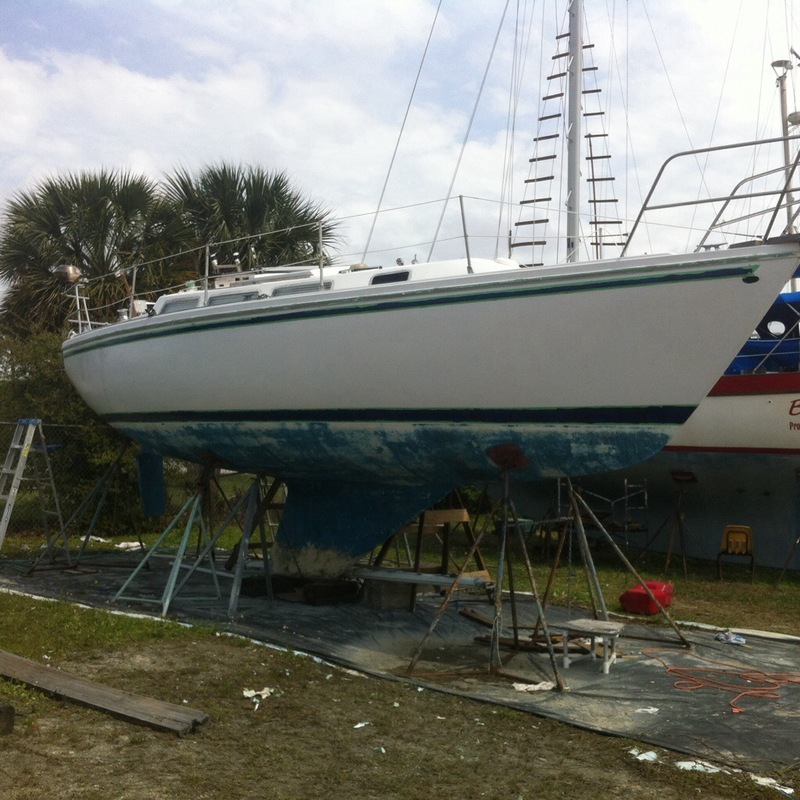 We managed to get her taped and painted with two coats of Navy Blue. Moving along..
Now we have to finish the bottom. This involves a new raw water intake thru hull and removing two old transducers for instruments no longer in use and patching the holes. 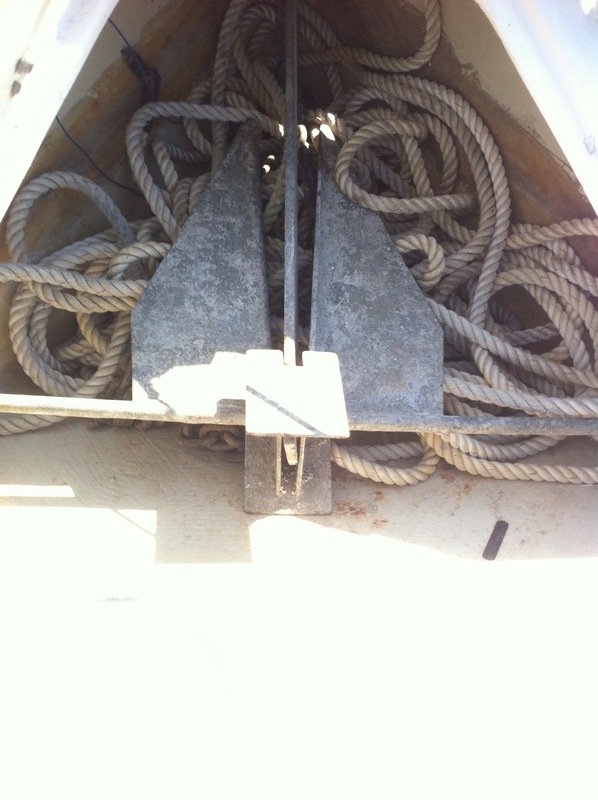 Old transducers and new bulkhead material. DC wiring is temporary, plan on mounting heat exchanger on this board. In the above photo you can see the new backing block for the raw water intake thru hull with light coming up from the hole, the two old thru hull transducers (one depth, one speed wheel), New forward bulkhead epoxy coated plywood panel for the heat exchanger. The far plywood bulkhead will be used to mount the raw water strainer and fresh water loop circulation pump. Behind it is the new waste tank from Catalina Direct. 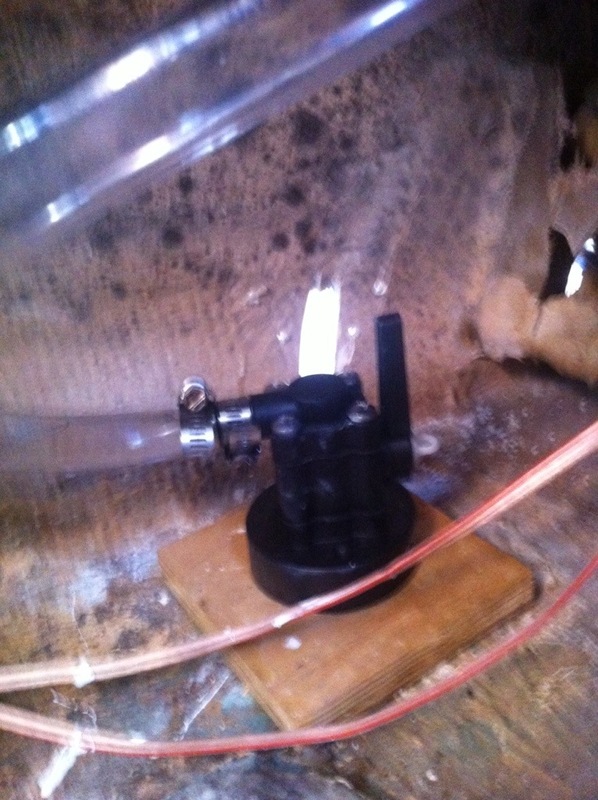 I also epoxy coated and mounted an aft panel to mount the ignition coil and ballast resistor on. 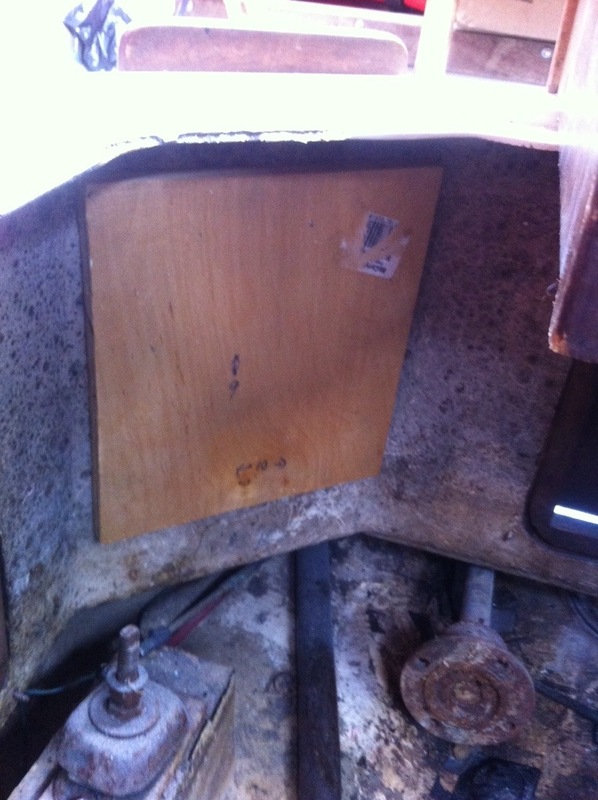 We removed the old transponders and I ground the exterior on interior glass. 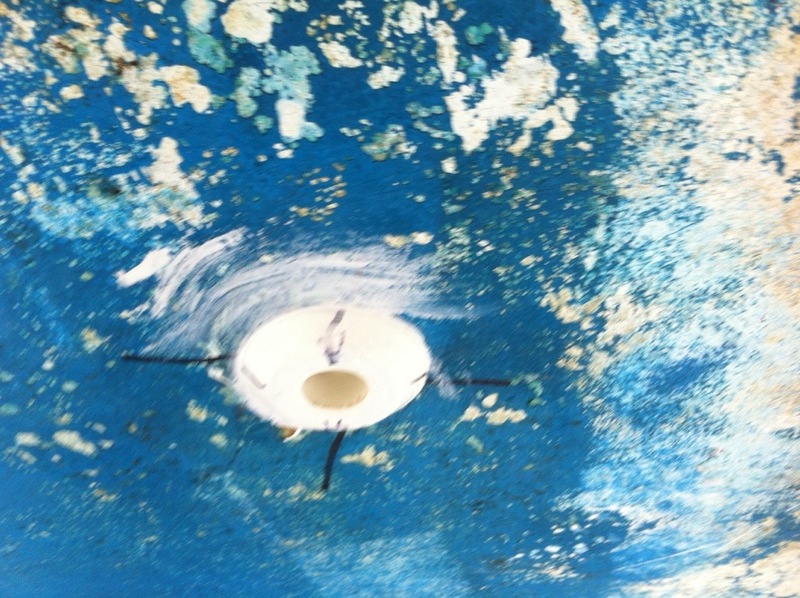 Here is a picture of the fiberglass mat I put on the exterior to start plugging the holes. 2 layers of mat, starting the hole repair. Over this mat on the outside I have already spread a thick layer of Marine Tex marine epoxy. I will sand it down smooth. On the inside I will fill with loose glass and then lay over a 12-1 fiberglass mat patch, it will be less the pretty but should not leak. We purchased 2 gallons of red ablative bottom paint. One thing that you don’t realize is that copper impregnated paint is heavy, heavier than normal paint by quite a bit. On the to do list in the next few weeks. Finish patching the two holes. 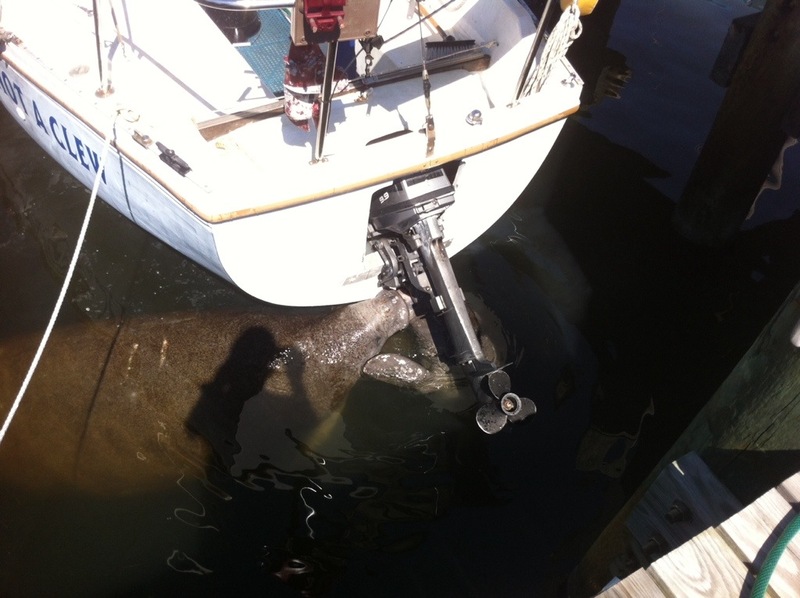 Install the raw water intake thru hull. 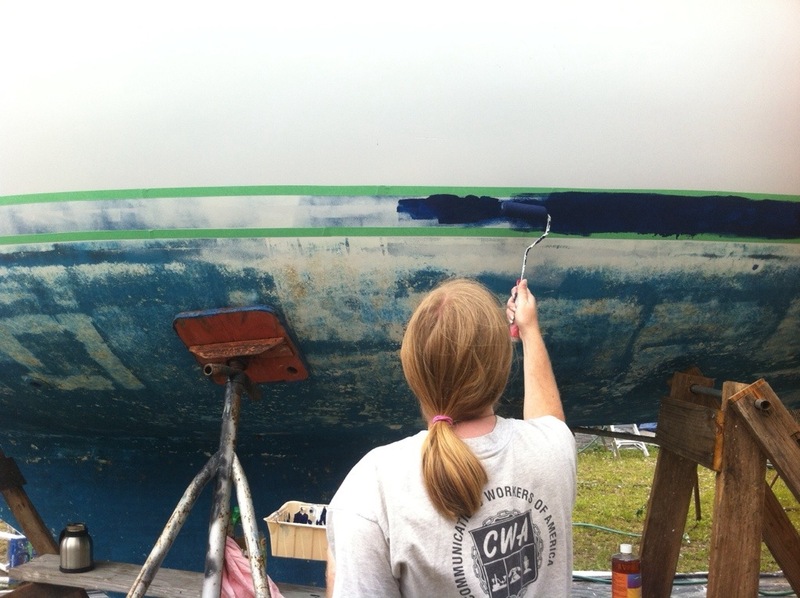 Clean the hull in prep for paint. Install a new zinc on the prop shaft. Install new three blade prop. 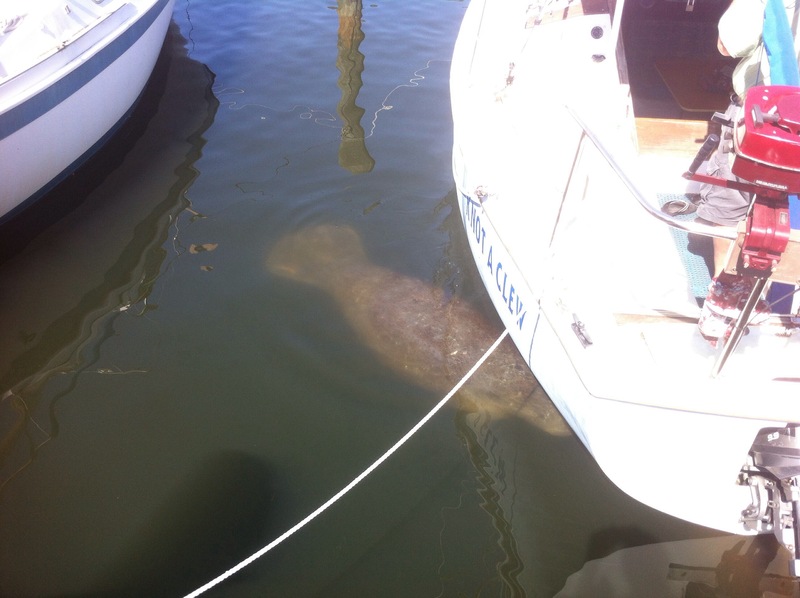 Put her back in the water. Easy, just a walk in the park…..
A quick note to kick off spring break. We have had the Clew for sale for about 4 months now, only a Craigslist add at the moment. We get a call every few weeks but hope things pick up now that the weather is warming and days getting longer. We may get a Boattrader listing as well. 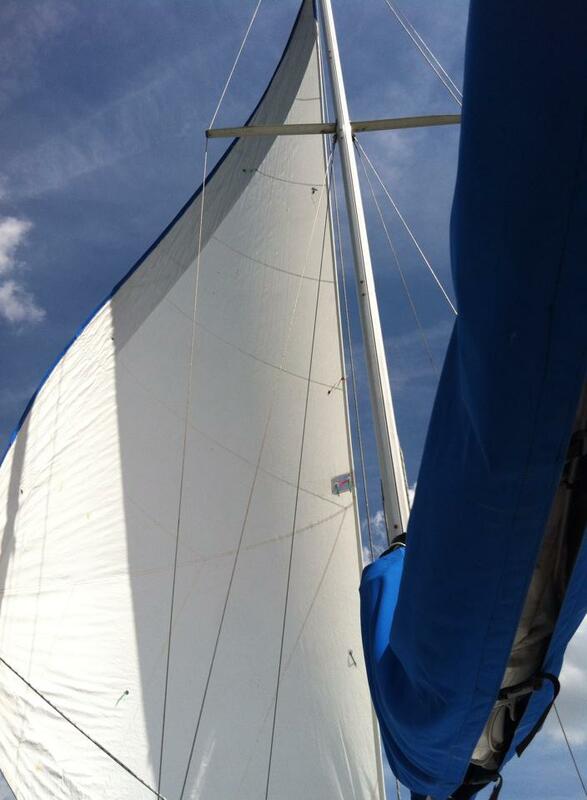 We took her out sailing for 4 hours or so yesterday, our first time since buying the Bell. Had a very nice little jaunt. Everything still works well, just a perfect day. We also updated the Craiglist advertisement with some interior pictures. 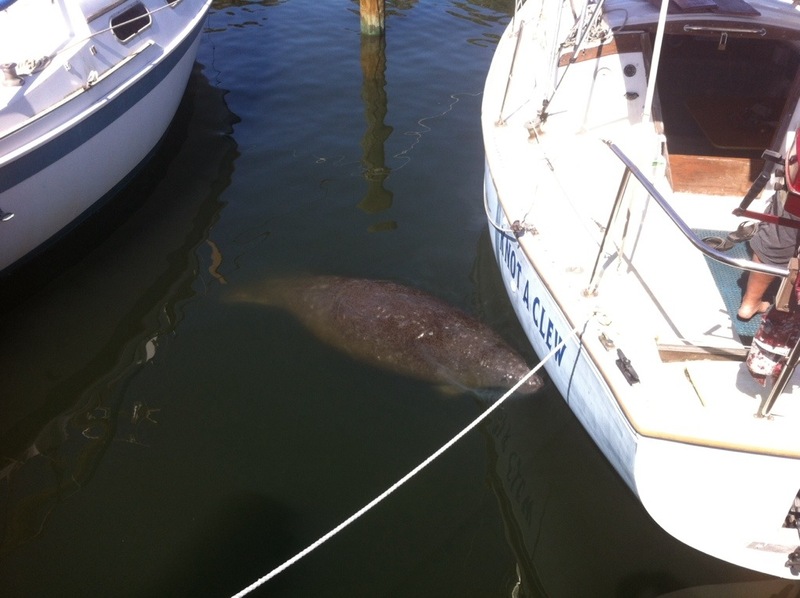 The best part of our sailing trip yesterday, it acted to remind us why we love it. I feel more motivated to get the Bell back in the water. After straightening up the Bell this morning whilst Charlie stood watch we headed over to the Clew. 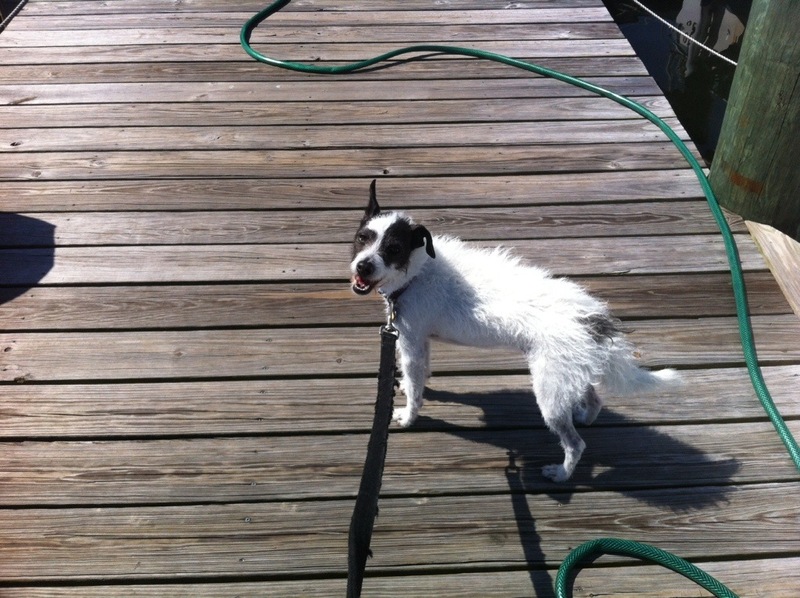 It was time for the Knot a Clew to have its quarterly scrub down. Our neighbor has decorated his slip for St Patties day. 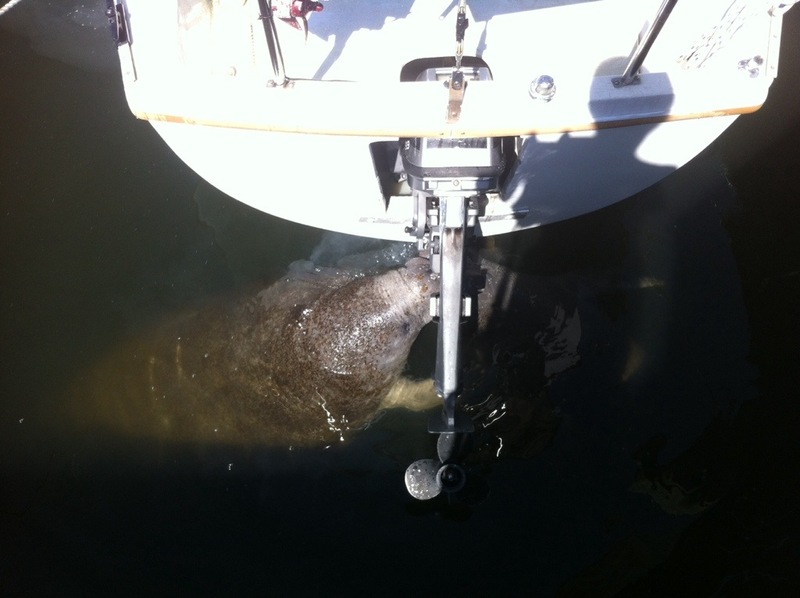 Our cleaning activity did not go unnoticed, Manatees soon arrived to enjoy fresh water run off. 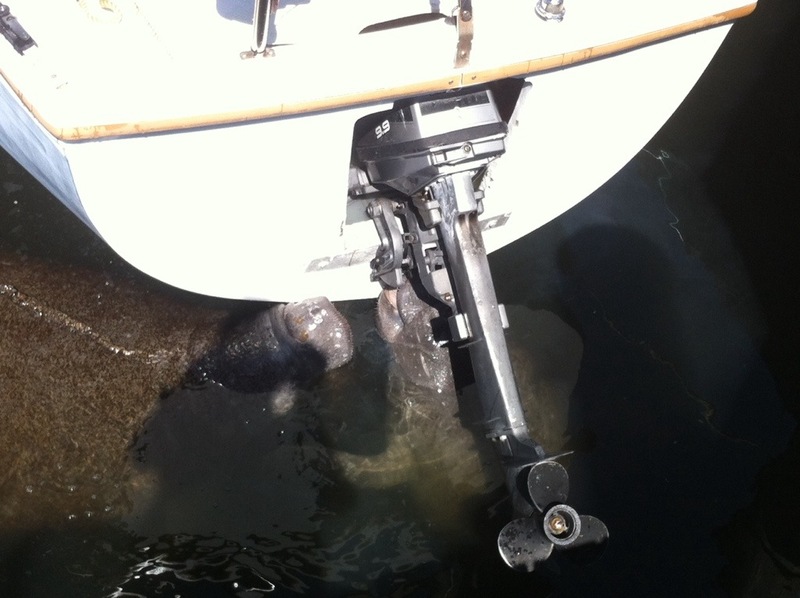 The critters were soon wrestling for position to get the water from the transom. 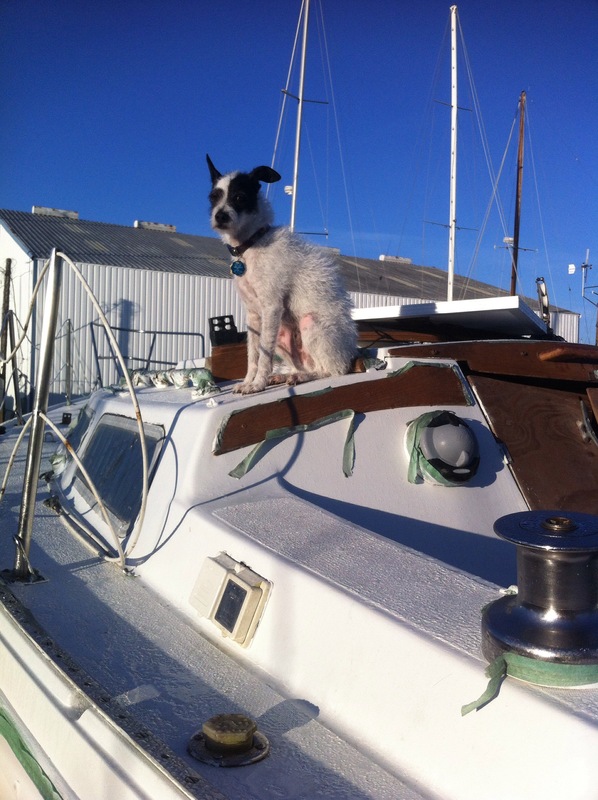 I think we will go sailing Monday, hope the weather holds. Bought a new anchor today. I frequent Cruisersforum.com and read the postings there. Lots of cranky old men giving advise. Last month they had a contest to win $1000 from Mantus anchors. Of course I entered but sadly did not win. However, last night Mantus allowed everyone that entered to claim 25% off any purchase. I decided now is the time to get a new hook. It will be replacing out fortress as our primary hook. Here is our old one in the locker. 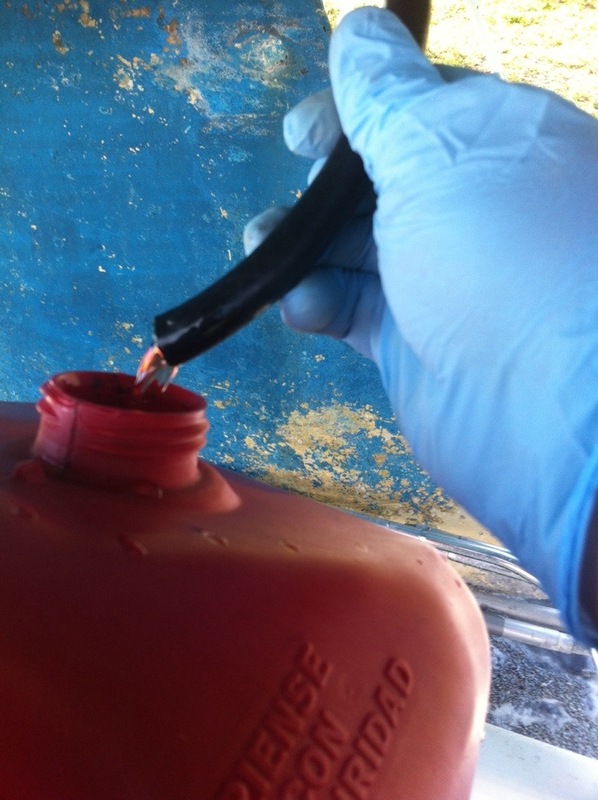 We just drained the fuel tank of 8 gallons of nice looking diesel. 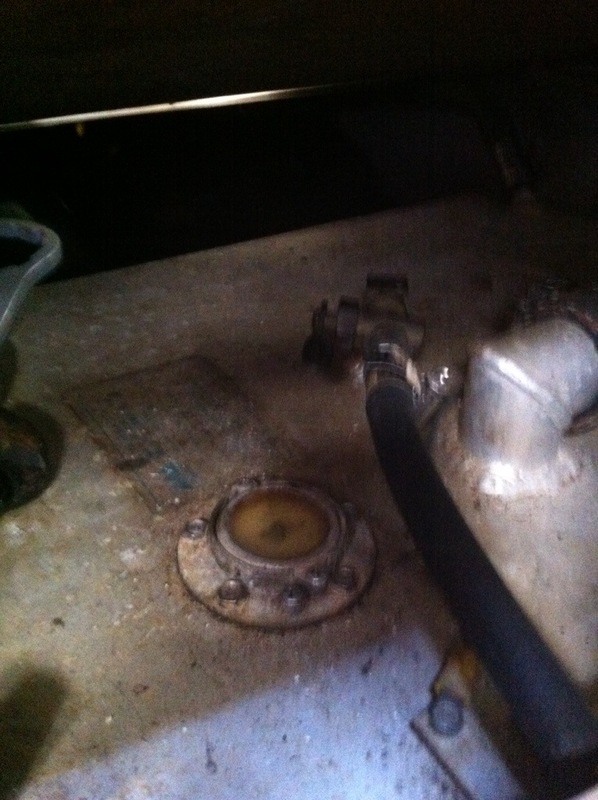 Lori worked the valve on the tank. I handled the jugs. It went surprisingly easy. Special thanks for John who supplied the wood scaffold to holt the jerry cans. 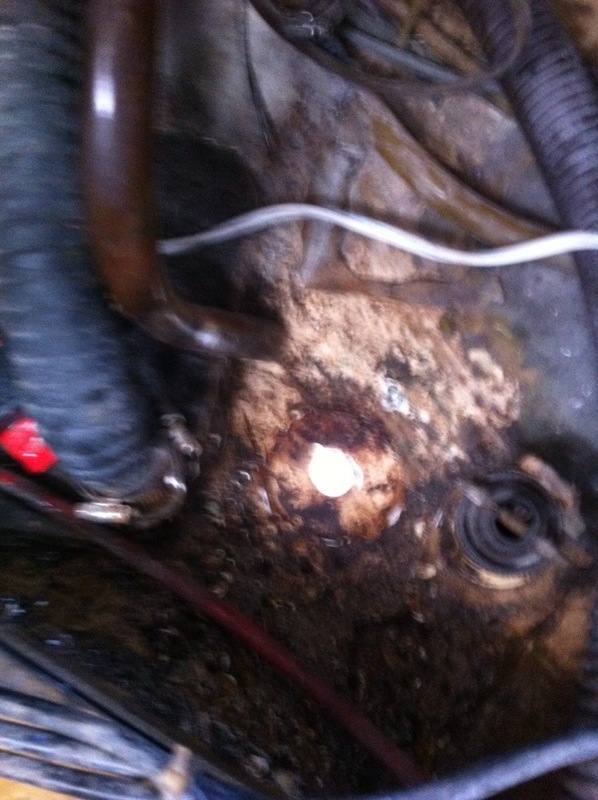 As you can see we drained it out the hole for the galley sink thru hull. Gravity did all the work. 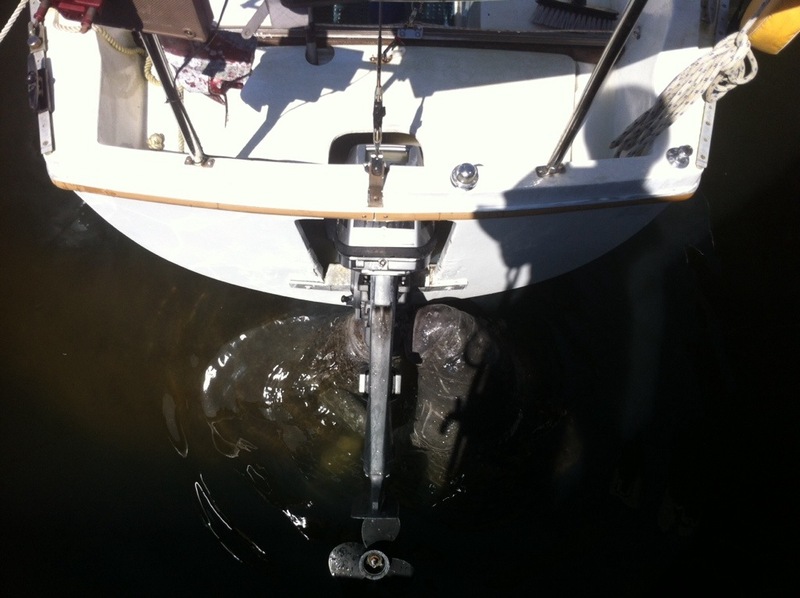 Today we removed the raw water intake thru hull. I used a drill split the retention nut on the inside. Then out she came. 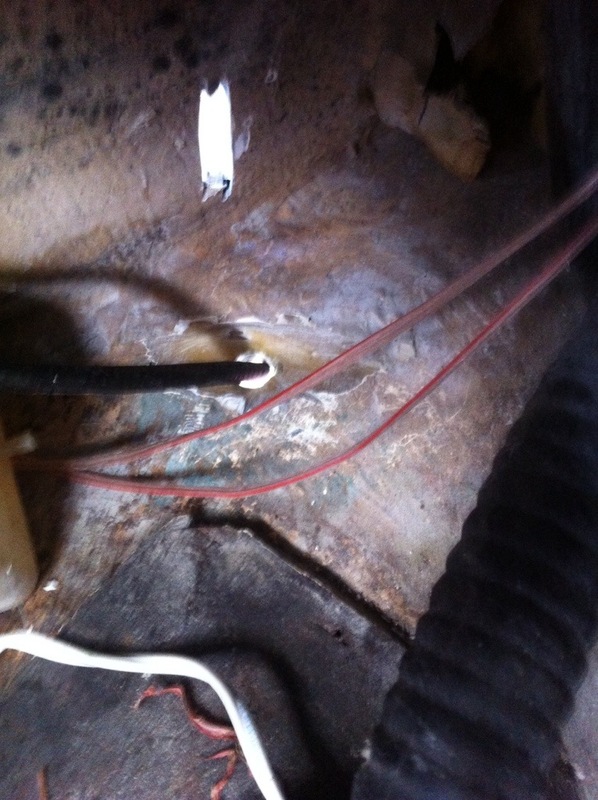 As you can see in the second photo the fitting had eroded away over time due to electrolysis. Both the screen and the threads. 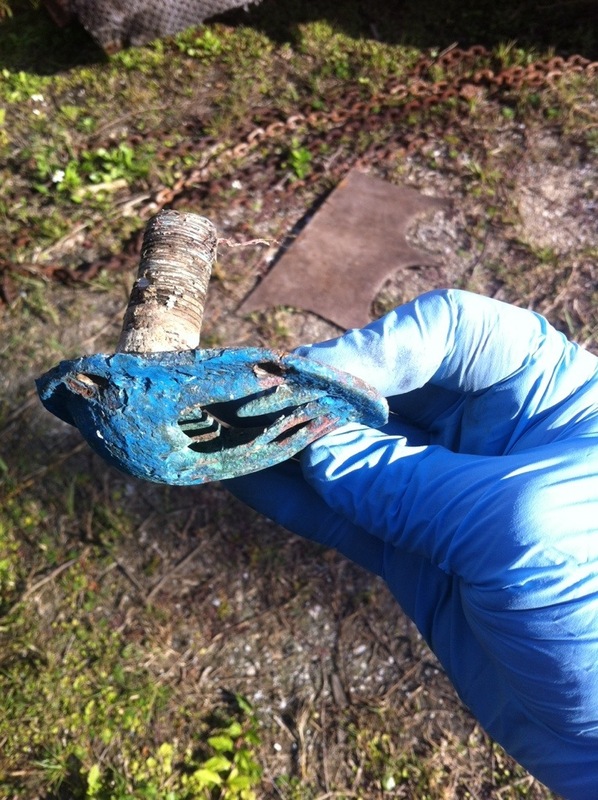 The valve that was atop this shattered with a tap of the hammer. The metal inside pink from electrolysis. 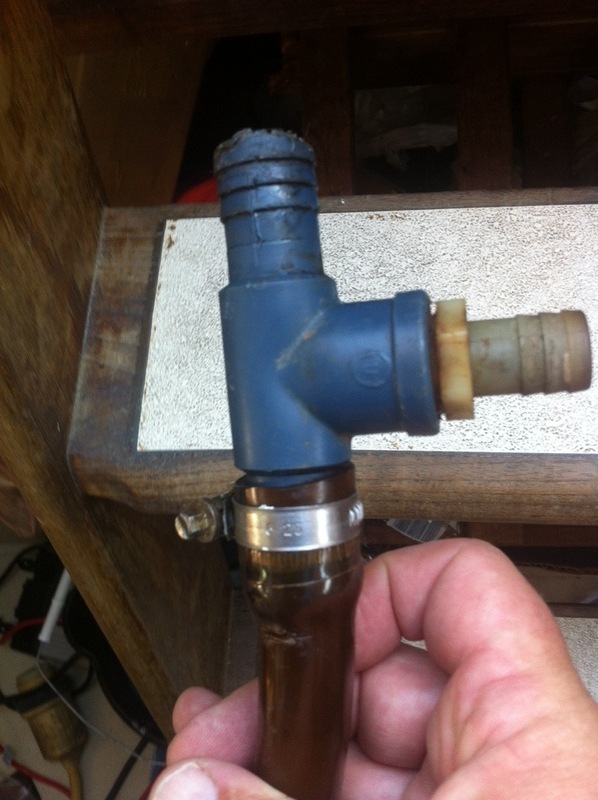 We will be replacing these with Marelon fittings. 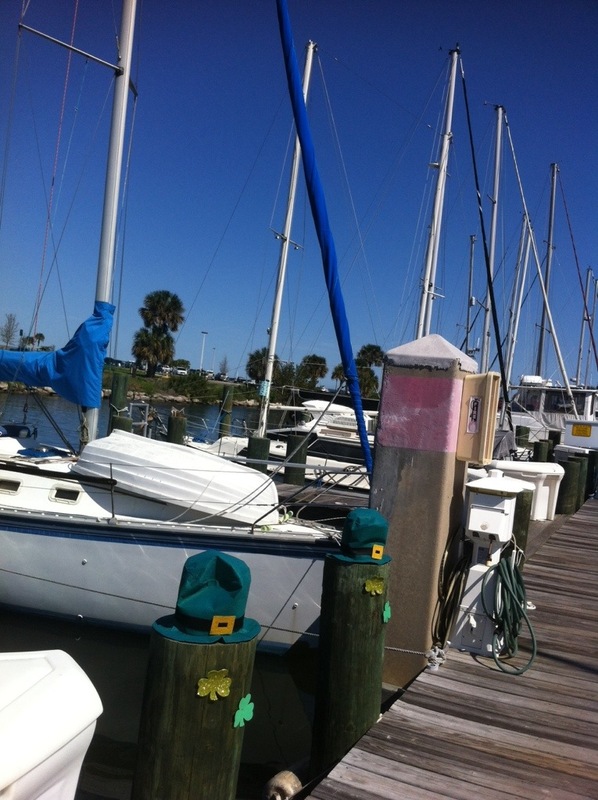 Plastic and immune to electrolysis common in marinas. Time to hit the showers and head to Chef Larry’s. Sunday we will be cleaning the Clew a bit before heading home as I have to work the late shift. And Now for something completely Different…..
Lori Bell is still afloat. As are plans and dreams. 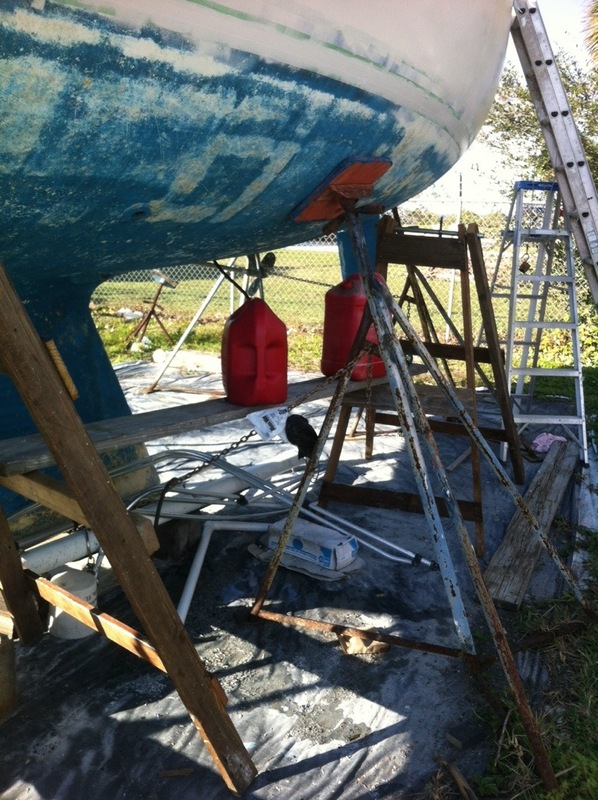 Hoisting up the Blue Peter. 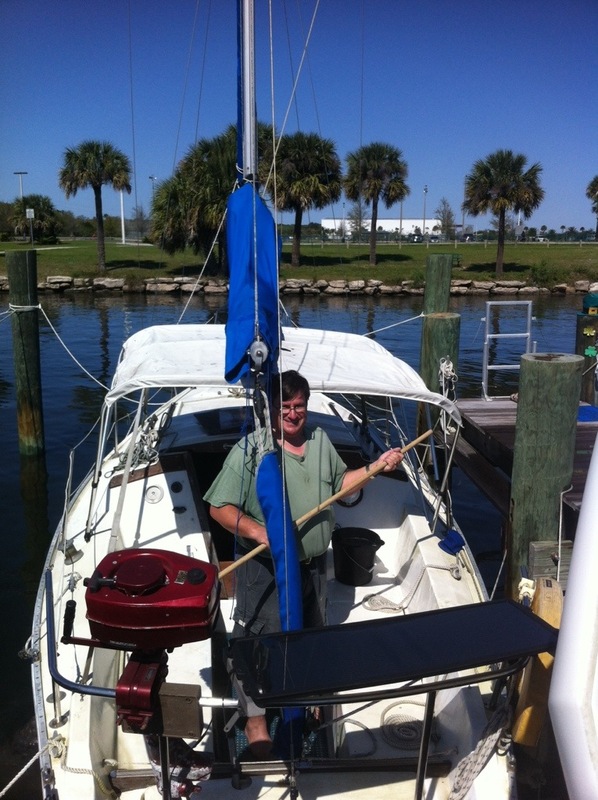 Fixing up, refurbishing and, hopefully, cruising a 1979 Catalina 30 sailboat.